Summary: Bloodlust. Magic. Forbidden secrets. Review: I'l be up front: there are lots of witches and vampires in the book, but it's not as lame as it sounds. I can handle some occult, but I'm not into magic so I was surprised that I liked this book. So original! So exciting so atmospheric and just beyond incredible! As soon as I opened the book I was sucked into it! This book was completely opisite to what I was expecting. Such a captivating plot that will have you on the edge of your seat. As soon as I opened this novel it pulls you in. So much is going on is just the first few pages. From the beginning till the end I was on edge turning each page. Its was like a time bomb waiting to happen it was fantastic. This book is a single serving of everything on the YA menu. You’ve got witches, vampires, and star crossed loves, combined with the clichéd cliques of high school. In this captivating novel, Darnell tells a beautiful love story about mystery, forbidden love, betrayal and magic. This story really captivates into another world. With different perspectives from Tristan and Savannah the reader is able to understand both emotions and from different views. I loved all the relation ships in this novel! Melissa and portrayed them so amazingly with her words! I love these characters and some I even love to hate. Savannah's best friend Anne is the best! She's not afraid to do whatever it takes to protect and defend Savannah. I love Tristan's older sister Emily. She is super smart and definitely someone you want on your side. 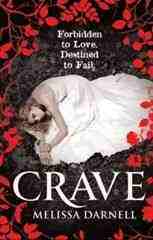 Read CRAVE, you won't be sorry, you will be welcoming Melissa Darnell with open arms. The excerpt from COVET at the end leaves you dying for more! If Tristan and Savannah were stuck on a desert island together what 3 things each do you think they would bring? Nothing! The beauty of having magical powers like theirs is that Tristan can always do a spell to summon whatever they need (including sunscreen for Savannah, firewood to keep them warm, fishing equipment, and a water filtration system to desalinate the ocean water), Tristan can start a fire with a single thought and draw energy from the earth (or in this case sand) beneath them, and Savannah can simply kiss him to draw all the energy she needs to stay alive. If Crave was made into a movie what actor/actress would you love to see play tristan and Savannah? Ah, my most favorite question, lol. I see every story like a fully detailed movie in my mind, and I always choose actors to represent each character so I can keep their appearances straight. For Tristan, I would choose Alex Pettyfer (he looked JUST like I pictured Tristan in the beginning of the movie Beastly!). For Savannah, I would choose someone like Emma Watson because her acting has a ton of depth that sort of draws you in, and she has a superb ability to portray a character who is both sweet yet strong. Or if not Emma, then definitely Bella Thorne from Disney's Shake It Up, because she looks EXACTLY like Savannah! If aliens landed in front of Savannah and, in exchange for anything she desires, offered her any position on their planet, what would she want? Oh lordy, I have no idea. Maybe she could become their star dancer for some alien opera house's ballet production? lol Though knowing her, she'd probably get tired of only being a dancer and want to start choreographing the entire show eventually. If Tristan were written about in the newspaper, on the front page, what would the headline say? Anne because that girl likes to eat (so she'll never judge me on how much I like to eat! ), and she'd end up making me laugh so hard I'd probably snort a veggie out of my nose or something! Plus she's based on my real life best friend from high school, whom I haven't seen in years and miss. My choice of restaurant would have to be either Olive Garden (because I proudly adore their food!) or Golden Corral (because their buffet has so much selection that you'll never get bored while eating and you can eat all you want!). And yes, I do realize it's a wonder that I don't weigh more than I do with eating preferences like these! What one song would suit Savannah and Tristan's relationship right now? For Crave, it would have to be Taylor Swift's Romeo and Juliet. Great post Casey! I'm definitely reading this book. Sounds like my kind of story.